Dog Christmas Tree Ornaments will appeal to the dog lovers you know. Find an ornament for your favorite dog breeds here! Anyone who loves dogs can't help but be charmed with a picture of their pooch to put on the Christmas tree. Dog Christmas tree ornaments are available for many different breeds. If you have a dog, you're sure to find your very own pal's look-alike in a Christmas tree ornament. I have gathered a variety of dog Christmas tree ornaments here. I hope you find a howling good dog ornament to make your pet proud. If you have a beloved doggy pet, you will know that a Christmas ornament that looks just like him or her is a welcome gift. People who don't have a dog just don't realize how much a dog can charm his way into your heart. Just the way a proud parent sticks a child's drawing on the refrigerator or hangs the little one's smiling face in a tiny frame to put on the tree, dog owners will like nothing better than to see the face of their furry someone hanging from a branch of the Christmas tree. Come see if your dog looks like one of these Christmas tree ornaments. Animal Den is a go-to place for pet gifts of all kinds. 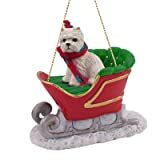 I've added a photo here of their West Highland Terrier in a stocking ornament, but you can find ornaments and many other products for not only most dog breeds, but cats, fish, bugs, reptiles, amphibians, barn yard animals, wild animals -- in other words, just about any animal you can think of! This dog is really cute! His legs wobble in the breeze. You can personalize the bone by writing your puppy's name with a sharpie marker. Hand painted. 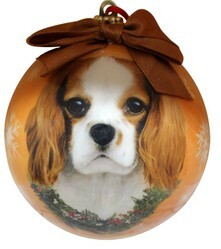 The dimensions of this ornament are 5" x 3.5" x 1"
Also comes in Golden Retriever, Shih Tzu, and Pug designs. Who ever knew that Santa Claus was a chihuahua? He sure fooled me under that disguise! This little guy is all dressed up and ready to play Santa. Thoughtful gift for someone who's recently lost a beloved pet. Christmas just won't be the same without them. You can keep a photo on your Christmas tree to remember your special pet's presence as the years pass. Giving a Christmas ornament photo as a gift to someone whose pet has passed away shows that you understand the importance of this special friend and the depth of the loss. What Kind of Dog Do You Have? I did have a little pound puppy for 16 years. I only have cats now. I have four dogs. Golden retriever, Jack Russell, poodle, JR/Chi. Finding the Right Breed of Dog for You. The ornaments on the right represent several different styles and several different breeds of dogs. One thing that's true about people with dogs -- the dog's breed is very important and expresses something about the owner as well as about the dog. The old adage that dogs look like their owners is in some ways true in that certain people are attracted to certain kinds of dogs. Having a dog is something like having a baby in this way: A dog becomes like a child in the family. When you have a dog, you need to feed him, groom him, play with him, give him walks and lots of attention. If you go on a holiday somewhere, you either need to take the dog along or find someone who can take care of him in your place. That's why getting a dog should involve careful consideration of how you will care for the dog. You need to choose a breed that fits your own temperament and personality. A hyperactive poodle is very different from a mellow golden retriever. If you know you tend to be high energy, you'll want a dog that you can take on a run or a hike. A person who prefers to sit and read may be driven crazy by a nervous dog who needs to be taken out constantly. But once someone finds a dog that he can really fall in love with, that person tends to get another dog of the same type if ever the first dog passes away and it is time to choose a new furry friend. Though this is not always the case, for most dog lovers, being faithful to a specific breed is important. That's why choosing an ornament that shows the exact breed of their own dog can be such a well received gift. Of course, an ornament can be enjoyed no matter what breed the dog is, but choosing that very special pooch will matter to the owner. Are You Looking for an Ornament Featuring a Different Breed? If you are looking for a specific breed you don't see here, Drs Foster and Smith have a website offering beautifully detailed ornaments representing 17 different breeds. The above link will bring you to their site where you can check to see if your dog's breed is represented. The ornaments are hand cast and hand painted with a high attention to detail. They come boxed, all set to wrap up and put under the tree or in the stocking of a dog lover you know. Drs Foster and Smith's website are offering their beautifully detailed ornaments at 30% off this Christmas season. This site now has thirty-seven different dog breeds to choose from when picking out your Christmas ornament. 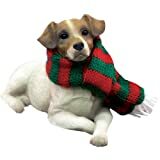 Many of them have Santa hats or red and white striped scarves to put the pooch in a holiday mood. Since the owners of the site are veterinarians, they offer a lot more than ornaments and gifts on their site, so you may want to browse their website for other pet needs as well. Check out the link above. Thanks so much for browsing these dog Christmas tree ornaments with me. I hope you have discovered one or two that really tickle your fancy. I'm sure that including a favorite dog at Christmas time will warm the hearts of the family members that love him. Music brings us all such joy! Honor the musician in your life with one of these Christmas ornaments with a musical theme. If you know someone with a passion for skiing, a Skier Christmas tree ornament will make a perfect gift! Thanks, Katie! I'm sure your pets enjoy the attention! Great idea, Brenda! I'm actually putting together a cat ornament wizzle, too. I like both. I went to a party once and the lady had all cat ornaments. Being more of a dog lover at the time, I started collecting dog ornaments.